She represents Australian Hip Hop to the core, with a career and passion that spans beyond measure. She has performed, shared, taught, studied and worked-shopped her love of Hip Hop and its culture to Sydney’s youth for over two decades and is a respected pillar of knowledge and undoubtedly one of the illest round the way female rappers this country has produced. 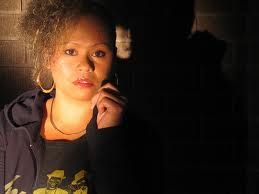 Thelma Thomas aka MC Trey, a name synonymous within the Australian hip hop community for spitting the truth, rapping with a cause and always being there for those that need her message the most. I remember when my Hip Hop journey started and I was becoming familiar with the who’s who in the industry I would one day chronicle and MC Trey has always been a solidified feature in our industry. She has carried her own solo career spans across nearly 2 decades performing alongside our communities realest artists and DJ’s, carving a niche for herself in the organic hip hop scene. Trey also found great success when joining forces with long-time friends and artist’s Maya Jupiter and DJ Nick Toth for their collaborative effort “Foreign Heights”, a Hip Hop trio representing Australia on an international scale. The outfit went on to release a successful album and subsequent singles which found their way to favourable position on the ARIA charts, enlisting a slew of nominations along the way. These days, life is at an even keel for community arts activist Trey, as she continues creating and immersing herself in making music with a message and has just completed a track highlight the plight of domestic violence called “The Light” featuring 26th Letter of Soul Benefits and MC Jae Tee as well as creating an EP and of course her tireless efforts with youth and community. MC Trey’s voice and presence is a formidable force in the Australian Hip Hop community and garners immense love and respect from fans old and new. This conversation is a testament to Trey’s focus, passion and overall love of this game and pays respect to one of the original female rappers in Sydney! Such a pleasure to finally get a chance to talk to you Trey …..How has life been treated you how late? Thanks for the opportunity and apologies for my delayed response…… Life is good. Juggling many facets of life. Keeping busy and enjoying what I do. Music, youth empowerment projects and spending time with my family. Most of the old school urban community in Australia is really familiar with whom MC Trey is and the extraordinary work you have done with Hip Hop and youth mentoring and guidance over the years ….. How would you best describe the ethos of MC Trey and why you do what you do? Participating in hip hop culture has given me so much – confidence, self-empowerment, knowledge, networks, critical thinking, etc. When I was younger, I never knew that hip hop would have such a profound effect on me. Music has always been a part of my life – you know r&b, island music, reggae, gospel music, pop music – but hip hop – that really made an impact on me and it’s important for me to pass on the awareness of these opportunities to the next generation. Well if we talking about Australia, you know women were there from the beginning both behind the scenes and front of house on stage. These days I find that there are a lot more female MCs and promoters, DJs and business woman. It’s awesome. I just wish had more female artists like Lauryn Hill today you know. Skill, style and knowledge. For me, Hip Hop culture is essentially about utilising whatever resources you have to better yourself. That is the message that I got. In terms of its message – it can be whatever you want it to be – that is the beauty of it. I love that anyone can partake – no matter who you are, where you form or what you do. If you down to participate or watch, it’s all good. It’s a powerful culture which can unite many. It can also be a powerful platform to voice issues. I released a single called ‘Light’ feat The 26th Letter (Soul Benefits) and MC Jae Tee highlight domestic violence. Currently working on an EP as well. We also made a video, it’s been while but felt good to start and complete a track and a video (shout out to Tania Safi). I think that we are so geographically isolated from the rest of the world – I don’t think the rest of the world are too concerned about what’s happens in Australia. Having said that though we have an opportunity to provide authentic Australian hip hop. We are such a diverse community and our music is starting to reflect that. That is what we have to offer the world. Indigenous hip – hop too cannot be made anywhere else but here. I reckon we need to push that, but also we all have amazing experiences and stories that can be shared with the world. What do you think are the ingredients to that make a great MC? Freestyle ability – unique delivery – diverse topic matter – with punch lines that shatter. Listening to instrumentals to write to. If you want something – go get it, don’t wait for it to be handed to you. Use your time wisely – you won’t get it back. Invest your time wisely. ← DJ Rampage – Mr International!